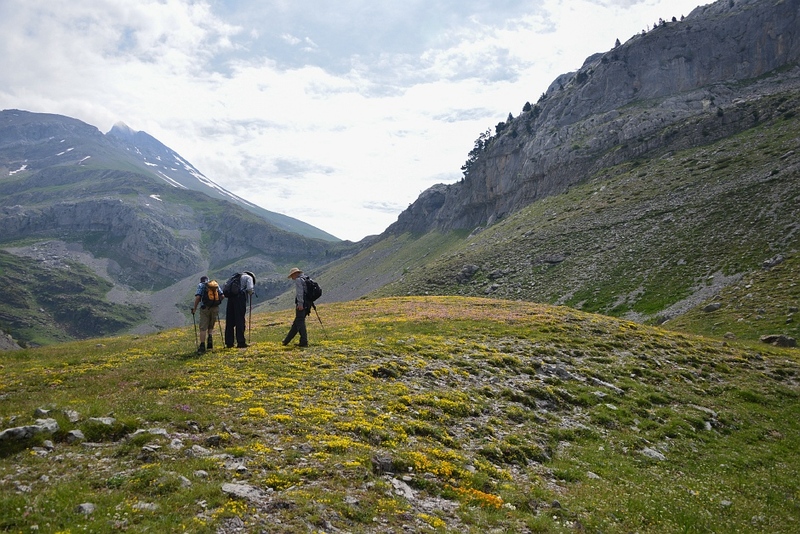 We have organised and led hiking and trekking tours in the Pyrenees for nearly 25 years. We´re still discovering new routes and magical spots only accessible on foot. 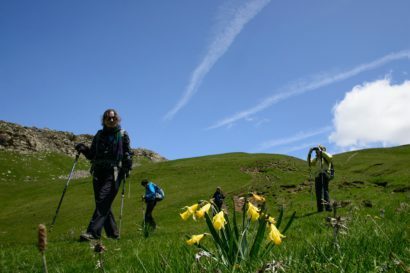 There are two main areas – the Foothills which are ideal for Spring and Fall and the High Pyrenees which are best explored from late May onwards. You can easily combine the two areas in a single trip. South of the main sierras the Foothills are the perfect choice for Spring and Fall hiking. Walk ancient paths connecting the villages, hermitages and monasteries of the old kingdoms of Ribagorza and Sobrarbe. This wild region of limestone outcrops, canyons and hilltop villages is steeped in history with 35,000 year old cave paintings in the sierras, aried Moorish castles, amazing Romanesque monasteries and medieval villages. Being between the high mountains and the plains the foothills have a fascinating flora and fauna with both alpine and Mediterranean species finding niches here. The spring flowers are fabulous with many orchids to be found. The birding is superb with species ranging from Wallcreepers to Black Wheatear plus many birds of prey including Lammergeier and Bonellis Eagle. 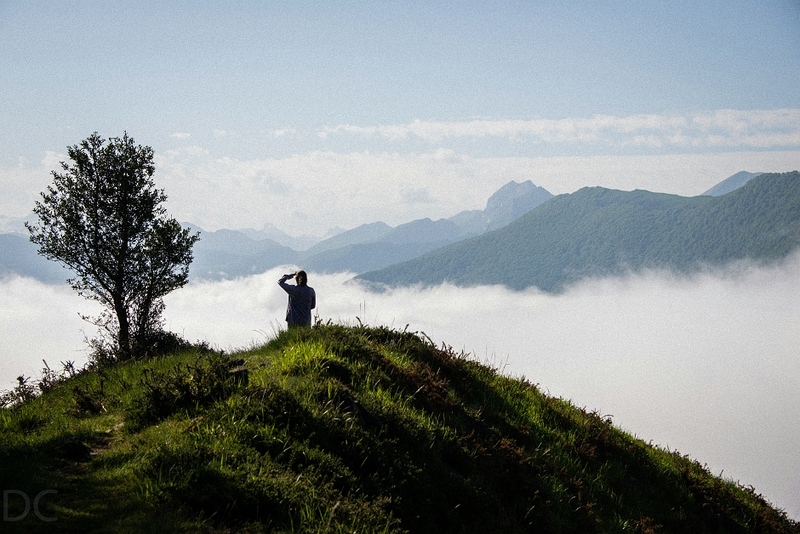 The valleys and peaks of the High Pyrenees are a natural paradise with hikes for all abilities. Experience the canyons of the Ordesa National Park, the pristine mountain valleys of Western Aragón and the majestic peaks of the Posets/Maladeta Natural Park crowned by Pico Aneto (3444m). Each valley has it´s own special character with lovely villages, very varied landscapes and many hiking options. We can tailor an itinerary to suit your fitness and interests and we try and keep hikes well off the beaten track. The wildlife, botany and birding in the high valleys is a real highlight for most people. An alpine meadow in June or July takes the breath away with a fabulous display of flowers and there may well be a huge Lammergeier soaring overhead! We have walked the breadth of the Pyrenees from the Atlantic to the Mediterranean 4 times and organised many fabulous treks staying high in the most beautiful mountains of Europe. Muchas gracias, You are extraordinary in your catering, competence and great character. Thankyou for everything, especially helping me over that tough (for me!) climb. Richard, your attention to detail, buoyant personality and cheerful support helped make this an extraordinary adventure. Not to mention the fresh, wonderful lunches and the superb hikes you gave us. It´s been unforgettable. Thank you for a wonderful vacation and being you.